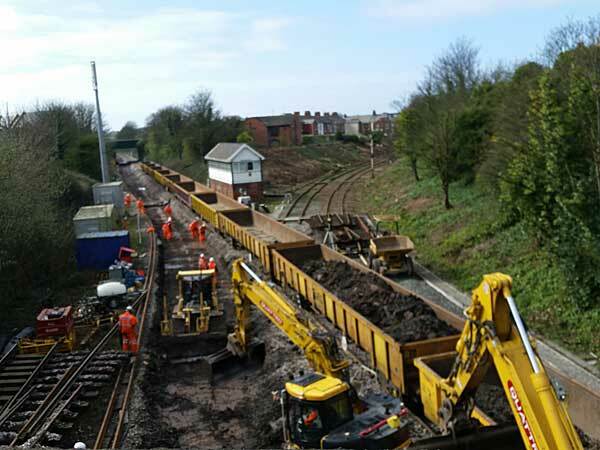 Work is underway at a fairly slow pace on electrifying more track in the North West of England. Currently the Manchester to Blackpool line is forecast for completion for the summer timetable of 2018. Work on re-aligning the track is underway. A big task will close Blackpool station from November 2017 for several weeks into 2018. Trans-Pennine routes from Manchester to York and Selby are underway. This is a large project involving 76 miles of track and many tunnels and bridges. 2022 is a date mentioned for completion. A 300metre stretch in the middle of Manchester, called the Ordsall Chord, is underway which will allow trains to go between Victoria and Piccadilly. Unfortunately it cuts off the track at the Manchester Science Museum that is the original stretch from the earliest Stephenson days. Forecast for completion in late 2017. There is talk of a High Speed 3 (HS3) link between Manchester and Leeds. As well as the HS2 link to Manchester and Leeds from Birmingham, creating a neat triangle. Although it isn’t certain what standard of high speed HS3 will be. Quite likely to be slower than HS2. Give that 20 years. In addition there is work scoping big changes to rail signalling. This will remove all trackside signals and put them in the drivers cab along with data exchanges that will enable trains to have moving clear stretches between them rather than them being fixed by stationary signals. Give that 30 years. There is a lot happening on rail. This entry was posted in Technological, Uncategorized. Bookmark the permalink.